An unlikely partnership between Hawaii’s local government and the US military makes the island a leader in energy policy. At the Asia Pacific Resilience Innovation Summit held in Honolulu, Hawaii, this week, Governor David Ige dropped a bombshell. His administration will not use natural gas to replace the state’s petroleum-fueled electricity plants, but will make a full-court press toward 100 percent renewables by 2045. Ige’s decisive and ambitious energy vision is making Hawaii into the world’s most important laboratory for humankind’s fight against climate change. He has, in addition, attracted an unlikely and enthusiastic partner in his embrace of green energy—the US military. Ige said Monday that LNG (liquefied natural gas) will not save the state money over time, given the plummeting prices of renewables. Moreover, “it is a fossil fuel,” i.e., it emits dangerous greenhouse gases. He explained that local jurisdictions in Hawaii are putting up a fight against natural gas, making permitting difficult. Finally, any money put into retooling electric plants so as to run on gas, he said, is money that would better be invested in the transition to green energy. Ige, trained as an electrical engineer, is leading his state in the most ambitious clean-energy program in the United States. On June 8, he signed into law a bill calling for Hawaii’s electricity to be entirely generated from renewables in only 30 years. He also directed that the University of Hawaii be net carbon zero in just 20 years. As a set of islands, Hawaii faces special energy difficulties. Residents pay the highest rates for electricity of any state in the union. Last year, before the recent oil price drop, residential electricity averaged around 36 cents per kilowatt hour (the US average is 12 cents/kwh). On the mainland, states that do not generate enough electricity themselves can import it from their neighbors. Islands in the middle of the Pacific just have what they can make themselves. Because Hawaii’s energy plants were built before it was economical to ship natural gas as LNG, they for the most part use petroleum. The high oil prices of the past decade are estimated to have cost Hawaii some $5 billion extra that was not anticipated. Part of the impetus for the current drive toward renewables is to escape the volatility of fossil-fuel markets. Senator Brian Schatz, a Hawaii Democrat, also addressed the summit, insisting that wind, solar, and other renewables are now competitive with fossil fuels and no longer “alternative.” Rather, they are practical today, because of significant price drops in the cost of photovoltaic panels and of wind turbines. He argued that change comes only when it is demanded. Several years ago, he said, Hawaii set what seemed like unrealistic green energy goals at that time. The senator’s point is valid. By 2015, officials wanted 15 percent of electricity generation to come from renewables. In 2014, it was already 21 percent. At the federal level, Schatz said that the Senate is coming around on climate change issues, with all Democrats backing renewables and even a lot of Republicans privately admitting the climate-change crisis. He said that the United States must lead at the UN’s Climate Change Conference later this year in Paris, but that the real test will be in the implementation of the goals adopted there. Luis Salaveria, director of the Department of Business, Economic Development, and Tourism, made the argument that green energy research in the islands could be the sought-after third leg of the stool for Hawaii’s economy, which now mainly depends on tourism and the military. The state is creating a number of research institutions and working with a consortium of private companies in what it calls an Energy Excelerator, which has generated $400 million in investment. Attendees at the summit were largely engineers, entrepreneurs, or military personnel seeking the first two, all of them confident that Hawaii can meet its stated goal. The state’s major utility, the Hawaiian Electric Company (HECO), is on board with the rapid turn to renewables and is partnering with the state and US military bases to meet the 2045 goal. Alan Oshima, the utility’s CEO, pointed out that 15 percent of homes in Hawaii already have rooftop photovoltaic panels, and he expected that number to triple. The rapid drive to renewables faces significant challenges. Environmentalists insist that flora and fauna be protected, and permitting is often a challenge. Some engineers are suggesting offshore floating wind turbines as an alternative to onshore wind, because they would be less intrusive. The Big Island of Hawaii has substantial geothermal potential, with an active volcano, but some native Hawaiians object to pursuing it lest the goddess of the volcano, Pele, be desecrated. On the other hand, other Hawaiians have been impressed by the positive experience of fellow Polynesians, the Maori of New Zealand, in profiting from geothermal energy on their land. Geothermal has the advantage for the Hawaiian grid of being steady and so able to provide baseload support offsetting the variability (called “intermittency”) of wind and solar, which can be generated only at some times of the day. Some 15 percent of the electricity generated in Hawaii is bought by the US military. 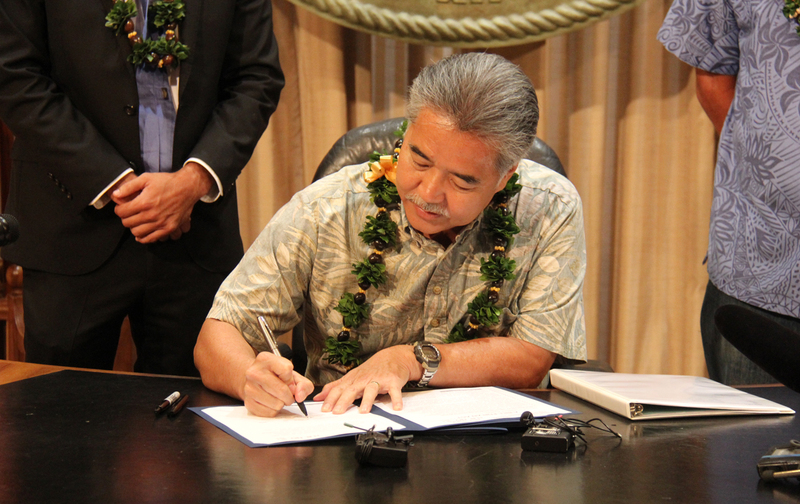 The Department of Energy has a mandate from the Obama administration to use more green energy, and Governor Ige and HECO are finding the admirals and generals enthusiastic partners in their plans for 100 percent renewables. In fact, the Navy, the Army, and the Marines all hope to generate up to a gigawatt of electricity themselves on bases throughout the United States. The Navy’s self-imposed deadline for doing so is only 18 months away. The state’s military bases want green energy in part to ensure base security. Amanda Simpson of the Army Office of Energy Initiatives told the summit that Army bases throughout the United States have seen a quadrupling in electricity outages during the past decade, some of them caused by more frequent extreme weather events, others by aging equipment and infrastructure. It seems clear that Hawaiian bases want back-up solar farms and biofuel plants in case the civilian grid falters. Simpson pointed out that all Hawaiian energy plants presently are on the coasts and so are vulnerable to a tsunami or to rising sea levels caused by the melting of polar ice because of global warming. She said that the planned biofuel electricity plant at Schofield Barracks is the only power plant in the islands to be built inland. Pro-army GOP representatives and senators may be climate change denialists, but the actual US Army is in no doubt that human-induced climate change is causing the seas to rise, and that this phenomenon poses a security threat to military installations on the coasts. US military installations in Hawaii not only have big plans for solar farms and leasing land and facilities to HECO for green-energy projects; they want to put their own uniformed engineers to work in research and innovation, partnering with Hawaiian and mainland entrepreneurs. Even a lot of their research money is coming from private investment in this research and development activity, with hopes of patents and future revenue streams going to the private sector. These military research centers, coupled with the state-backed Excelerator and other R&D enterprises, have the potential to make Hawaii an indispensable center for green-energy innovation and to allow the state to profit from breakthroughs and from selling them abroad. The attendees at the summit, many of them entrepreneurs and inventors making pitches to the Hawaiian government or to the US military, were full of energy and optimism. Unlike in most of the Lower 48, where legislatures are often putting obstacles in the way of residential solar or luxuriating in a blithe state of denial about the challenges of global warming, Hawaii is getting it done. The steely vision of Governor Ige, the vigorous commitment of Hawaiian Electric Company, the inventiveness of the engineers and businessmen, and the can-do attitude of the generals and admirals on the state’s bases are creating an extraordinary public-private set of synergies that hold out hope that the worst climate-change scenarios can yet be avoided. Editor’s note: This piece originally stated that some 50 percent of electricity generated in Hawaii is bought by the US military. In fact, the US military purchases some 15 percent of electricity generated in Hawaii. The text has been updated to correct the error.